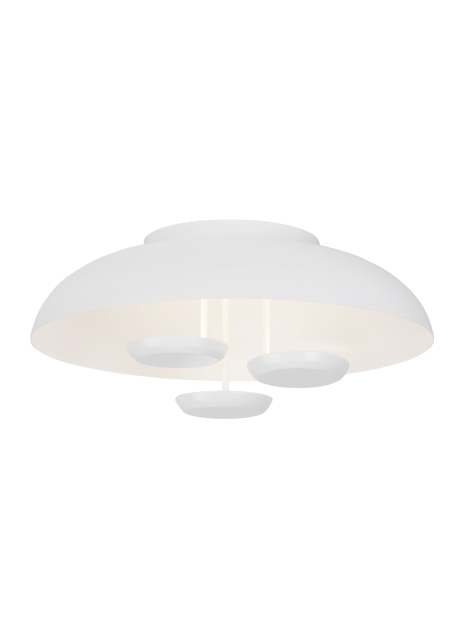 The Plura ceiling flush mount light by Tech Lighting features beautifully detailed circular metal discs that are suspended below a domed reflector creating a celestial glowing effect when illuminated. The discs push a wide-angle wash of LED light upward into the 24-inch dome to provide an abundance of indirect light. With its smooth general illumination and modest scale, the Plura flush mount is ideal for living room lighting, family room lighting and bedroom lighting. The Plura comes with an energy efficient integrated LED lamp, this lamp option is fully dimmable to create the desired ambiance in your any space. Includes 36 watt, 2032 delivered lumen, 3000K LED module. Dimmable with low-voltage electronic or triac dimmer. Width -- Choose -- 24"